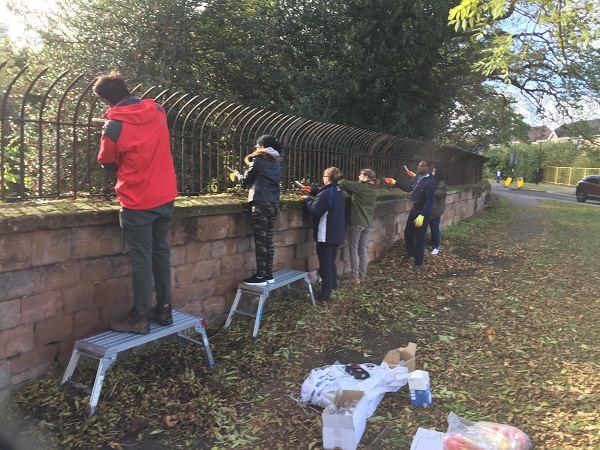 Warwick University students joined forces with Council staff to renovate some railings at the historic London Road Cemetery. The students are all members of Warwick Volunteers, a group that allows students to volunteer in the community all around the city. They were invited by Richard Dale of the Property Services Team to carry out some work at the Cemetery last week. Richard said: “It was a great event, with seven members of the Warwick Volunteers helping to strip back the brown rusted railings with wire brushes and paint them a new shade of green.